Habit: Plant 1--8(18) cm. Stem: +- leafless between proximal forks. Leaf: +- acute, mucronate, longest 8--18 mm; largest distal leaves 3--10 mm, 1--2 mm wide, elliptic to spoon-shaped. 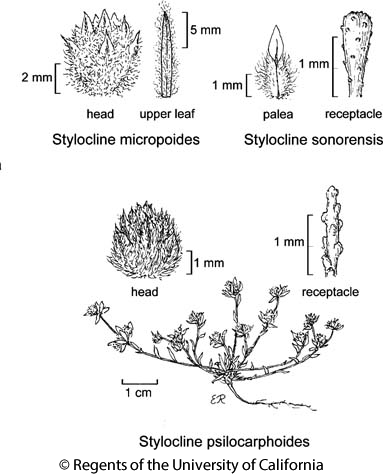 Inflorescence: heads ovoid, tomentose, largest 3.5--5 mm, 2.5--4 mm diam; phyllaries 0 or <= 0.5 mm, +- awl-shaped, deciduous; receptacle 2--3 mm, 5--8 × width, +- cylindric; longest paleae 2.8--3.3 mm, winged distally, wing oblanceolate to teardrop-shaped, widest in distal 1/3 of palea, palea body cartilaginous; outermost paleae open, concave. Disk Flower: ovary 0.1--0.3(0.4) mm; corolla 1.1--1.7 mm. Fruit: 1.1--1.6 mm, compressed front-to-back; disk pappus bristles (0)1--3, 1.1--1.5 mm. Ecology: Open, generally stable, sandy or gravelly, rock bases, drip lines; Elevation: 100--2000 m. Bioregional Distribution: n edge TR, SNE, DMoj, w edge DSon; Distribution Outside California: to southeastern Oregon, southwestern Idaho, southwestern Utah. Flowering Time: Feb--May Note: See also Stylocline masonii. Citation for this treatment: James D. Morefield 2012, Stylocline psilocarphoides, in Jepson Flora Project (eds.) Jepson eFlora, http://ucjeps.berkeley.edu/eflora/eflora_display.php?tid=5187, accessed on April 21, 2019.
n edge TR, SNE, DMoj, w edge DSon; Markers link to CCH specimen records. Yellow markers indicate records that may provide evidence for eFlora range revision or may have georeferencing or identification issues. Purple markers indicate specimens collected from a garden, greenhouse, or other non-wild location.